You need smart, dedicated staff to run a successful transportation business. But given the challenges a transportation company faces each day, that staff needs support from powerful information technology. A transportation management system (TMS) is a vital tool for turning pain points into opportunities. Shippers expectations keep going up. They want faster transit times, lower prices and better visibility. TMS software helps you design an optimal supply chain solution for each customer and execute according to plan, choosing the right equipment and the right route for each load. It also keeps dispatchers, customers and customer service reps aware of shipment status every step of the way. Each shipper has unique requirements—different pickup and delivery expectations, delivery windows, equipment needs, cost constraints, communications processes and more. You must keep track of each customer’s preferences and always meet those expectations. TMS software makes it easy to create a profile for each customer and apply the right rates, business rules and other specification to every transaction. The federal government’s Compliance, Safety and Accountability (CSA) program evaluates a carrier’s safety performance in seven categories. Hours of service (HOS) regulations constrain each driver’s working hours. By December 2017, most commercial trucks will have to carry electronic logging devices (ELDs) to document HOS compliance. By making your operations more efficient, a TMS solution lets you operate profitably while meeting these and other government mandates. To maintain solid margins, you have to reduce empty miles and make good use of drivers’ available hours. Moreover, to retain your best drivers, you need to give them routes that earn them money and don’t keep them away from home for too long. TMS software helps you manage your assets in a holistic way, creating routes that meet your customers’ needs and also extract maximum value from the resources you command. The more customers you serve, and the more loads you move, the more details you manage. Manual processes foster human error, and errors lead to missed deadlines, incorrect invoices and unhappy shippers. Paperwork also takes up time that staff could otherwise spend pursuing new opportunities. With a TMS system to automate day-to-day processes, your operation runs more smoothly, and you leave your employees free to focus on value-added activities. You also stand out in the eyes of shippers who expect their partners to take advantage of sophisticated IT tools. 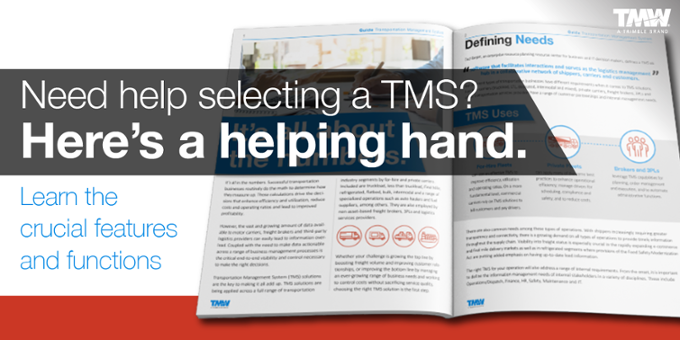 If you’re not already using TMS software, you’re missing many important opportunities. Contact TMW Systems today to learn more about how a well-designed, fully integrated TMS solution can help you.